Buy E.P. 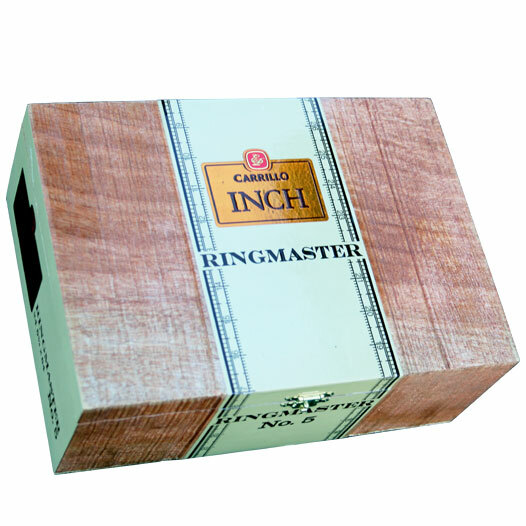 Carrillo Ringmaster Cigars Online! EPC Cigar Co.'s most popular brand—INCH—has received a Nicaraguan-inspired blend for the first time, introducing the INCH Ringmaster! As Ernesto Perez-Carrillo, founder and master blender of EPC Cigar Co., is often credited with helping to ignite the modern craze for full-bodied and mega-sized cigar offerings (beginning with his previous work at La Gloria Cubana), it only makes sense that his famed INCH lineup of cigars would make the leap into the fiery soils of Nicaragua. With INCH Ringmaster, each size in the collection sports a whopping 64 ring gauge. The cigars are named as such because they are each a full inch in diameter (with cigar ring gauges being derived from 64ths of an inch). While the cigars—like all other INCH blends—are crafted in the Dominican Republic at Carrillo's own La Alianza factory, the blend is entirely Nicaraguan. This makes for a spicier rendition, showing a medium-plus to full-bodied blend, highlighted by notes of earth, leather, hardwoods, loads of zesty cabinet spices, and sweeter subtleties of cocoa and creamy coffee.